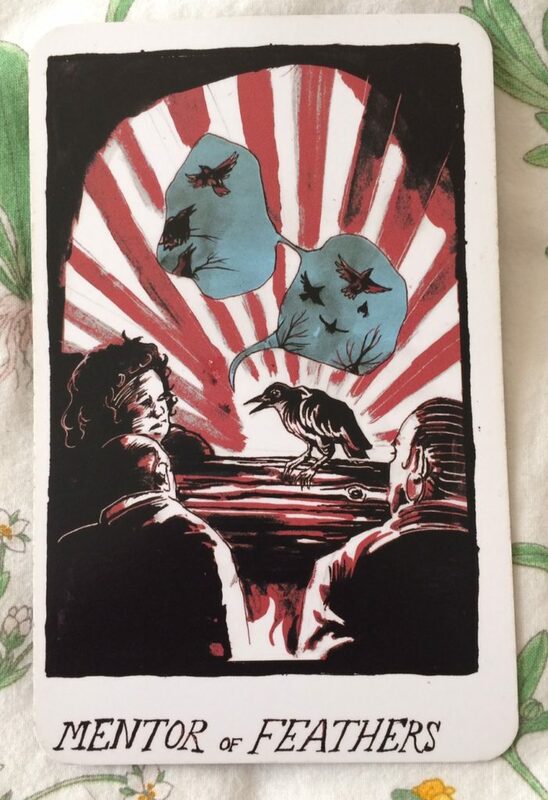 Mentor of Feathers from the Collective Tarot: A bird tells a story about birds as three humans look on. I understand this card best when I look for how it differs from the previous card. 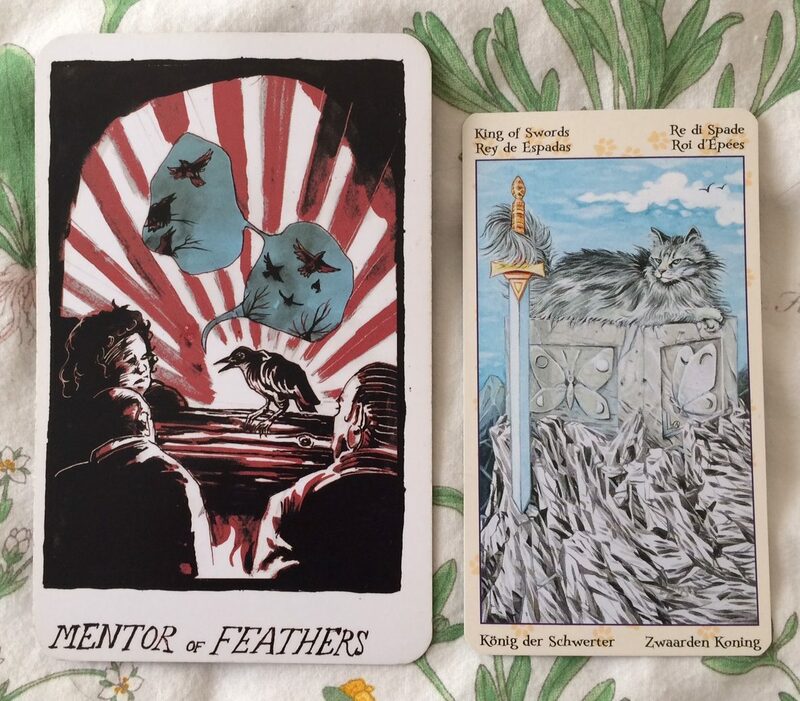 While the Artist of Feathers created art to speak their truth, the Mentor is able to speak more frankly about themselves, including their mistakes and weaknesses. They are able to revel in their shortcomings because they know that they are a part of the whole. I hope I can be the Mentor of Feathers: self-effacing, but not self-deprecating; able to tell my story while making clear what my failings have been. It’s all part of the story. 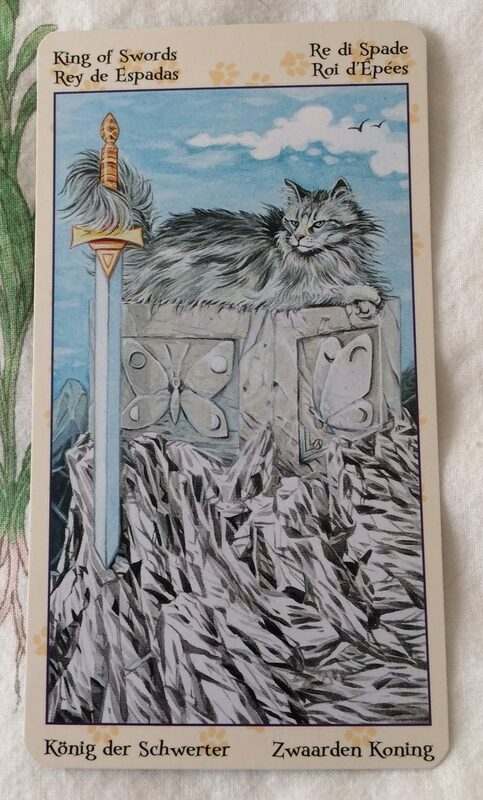 King of Swords from Tarot of the Pagan Cats: A fluffy cat sits on a pedestal with butterflies carved into it, surrounded by ice or sharp rocks. They have their tail holding a sword and look wholly unimpressed. I tend to think about the King of Swords as a more rigid version of the Emperor. It shows a particularly stern type of leader, where the emotional may have been mastered to the point where they are completely irrelevant. This could refer to a person who has lost touch with their emotions. If it is a card meant to give guidance, it might be asking you to table your emotions and act logically. There will be a time to feel your feelings, but this is not it. Be measured and thorough. Do your research. Take all of that and ask it to act decisively and ethically. I struggle to do that more than folks may think, but I am getting better at recognizing when my emotions are causing me to behave in ways I normally wouldn’t choose to. This is a good reminder to take a breath and act like the person I want to be.